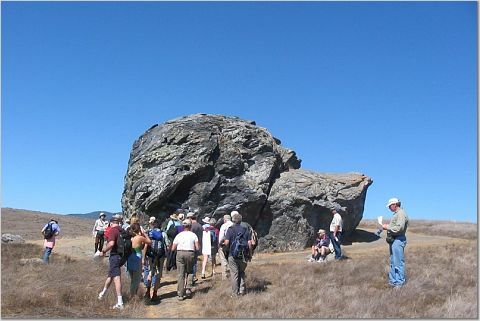 The Northern California Geological Society is a non-profit organization for the promotion of geology, theoretical and applied, and related fields of natural and technological sciences. 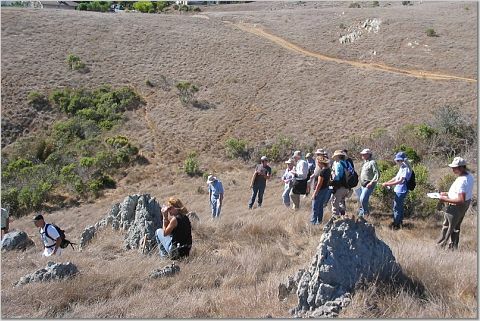 Weather conditions could not have been better for a field trip on September 11th when NCGS member David Bero, P.G., R.G., led a geological tour of the Tiburon Peninsula. 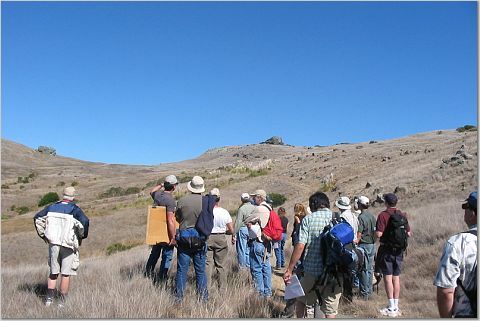 Tiburon is home to the Ring Mountain Preserve and some unique exposures of high grade metamorphic rocks interpreted to be associated with a subduction zone complex. David’s excursion showcased some of the exotic rocks of this region and the complicated stratigraphy that has challenged the interpretive powers of our best geologists. 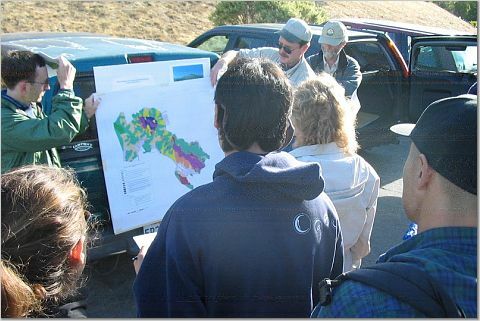 The group assembled in the parking lot of Shepherd of the Hills Lutheran Church just south of Ring Mountain, where David presented a general overview of the day’s events and a geological summary of his mapping project, including a discussion of the stratigraphy and structural relationships on the peninsula. The gross structure consists of a low angle thrust fault separating a hanging wall ophiolite complex from a footwall sandstone-shale-chert-conglomerate sedimentary assemblage containing very minor greenstone volcanics. The hanging wall ophiolite is comprised of harzburgite peridotite ultramafics and serpentine-talc schist containing the large blocks of high grade metamorphic rock for which Ring Mountain is famous. The underlying sedimentary-volcanic sequence is dominated by interbedded graywacke and shale, and chert. Pebble conglomerate forms key marker horizons and greenstones are relatively uncommon. The graywacke and chert are in fault contact with the ophiolite and change dramatically as one approaches the fault contact. The normally reddish chert becomes highly fractured, microbrecciated, and silicified near the fault contact. Solution activity has bleached and recrystallized it, and bedding laminations are often complexly folded. The graywackes take on a foliation toward the fault contact, and exhibit abundant silica-filled fractures. Metamorphic grade increases from pumpellyite facies to lawsonite facies toward the contact. The latter occurs over a distance of only 100 to 200 feet. These textural and mineralogical changes are key evidence for David’s structural interpretation, and aided in mapping this poorly exposed terrane. Upper thrust plate ophiolite remnants or klippe occupy the upper portion of Ring Mountain, and a NW-SE trending exposure dominates the peninsula southeast of Ring Mountain. The oldest rocks in the terrane belong to the hanging wall Jurassic ophiolite, dated at 150 to 160 million years. The ages were taken from high temperature metamorphic blocks, and provide an age that places them cogenetic with the Coast Range ophiolite. 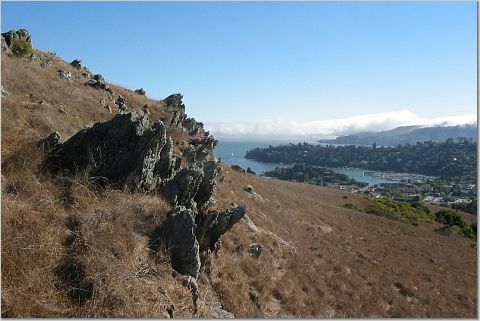 The relationships David saw in the local high grade metamorphic terrane while living in Jenner, California, are reflected on the Tiburon peninsula. 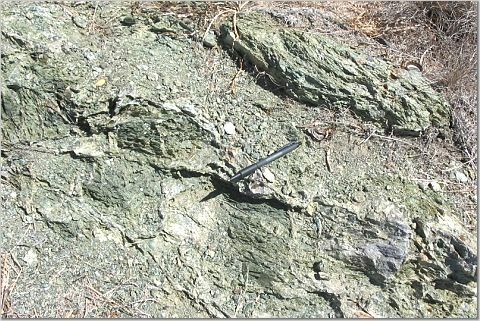 The eclogite-amphibolite-blueschist assemblage revealed here was formed at depths of about 15 to 30 km. and under high pressure in a subduction zone. As the group hiked northward up the hill behind the church, David pointed out exposures of red-bedded chert on the trail, and a distant outcrop of pebble conglomerate. The contact between the two units is apparently a fault but lateral continuity is lacking. David interprets these units, interbedded with abundant graywacke sandstone and shales, as belonging to the footwall Franciscan sedimentary-volcanic terrane. The transition from a smooth slope morphology to a blocky topography above the inferred thrust fault plane mirrors the lithologic changes from the Franciscan sedimentary-volcanic rock units below it to the ophiolite assemblage above. Rocks exposed on the trail are mildly altered medium-grained sandstones and sandy siltstones containing angular to subangular particles of quartz, albite, and biotite with secondary muscovite, chlorite, and pumpellyite (a low grade zeolite mineral). Technically, they are low grade metagraywackes. Heading northwestward toward the third stop, the metagraywacke takes on a different character. The sediment becomes coarser, reflecting original facies changes, but more importantly, a lineation develops that becomes stronger as one continues uphill toward the fault contact. Approaching the fault contact, the fabric is cataclastic, essentially a pulverized agglomeration of crushed and elongated quartz-feldspar grains in a chlorite-white mica-quartz flour matrix. The metamorphic mineral lawsonite appears as euhedral lath-shaped crystals associated with chlorite, in a low-grade blueschist facies assemblage. The close proximity of this shear zone to the overlying ophiolite terrane implies that a very thin high P-T zone existed along the thrust plane during ophiolite emplacement. These textural features can be traced around Ring Mountain immediately beneath the ultramafic unit capping the hill. 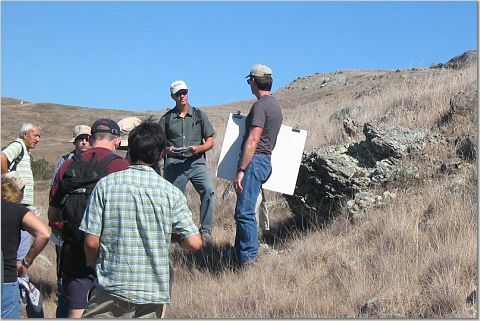 A short distance up the hill, the group passed over the poorly exposed low-angle thrust fault contact into the hanging wall ophiolite terrane. Here the serpentine-talc matrix is exposed in sparse outcrops and the large high grade metamorphic blocks jut out of the ground. The latter span a wide range of protolith composition from cherts and sandstone/shale to basalt (greenstone). They have been exposed to high P/T conditions and converted to blueschist, eclogite, and amphibolite metamorphic facies mineral assemblages. The trip paused briefly at one of these blocks while Dr. John Wakabayashi, a well-known Bay Area geotechnical consultant and an expert on Franciscan tectonics, discussed its complex mineralogy. John has also been working for several decades to unravel the secrets of the Franciscan terrane. 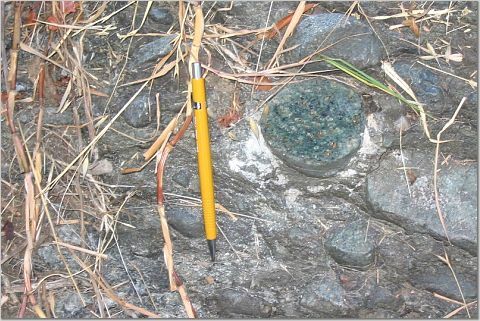 His extensive studies indicate that approximately one-third of the Franciscan is blueschist grade rock, but requires thin section microscopic examination to confirm this. The isolated high grade blocks exposed at Tiburon and along the Sonoma County coast at Jenner represent much less than 1% of the formation by volume. They are, however, excellent tectonic indicators and their mineralogy records the high pressure-low temperature and high temperature conditions they experienced during their transport down the subduction zone and during subsequent exhumation. The mineralogical assembages exposed within these blocks and their thin outer reaction rinds range from garnet amphibolite facies through eclogite facies to blueschist facies in a pressure-temperature trajectory that traces decreasing thermal conditions, and increasing to decreasing pressures, respectively. The temperature peaked at over 650ºC and pressures reached a maximum equivalent depth of 50 km. These conditions have been replicated and confirmed by laboratory mineralogical studies conducted under controlled pressure-temperature experiments using bulk compositions identical to the protolith. John noted that there is no silicic crustal component in the exotic high grade blocks. The protoliths are basalts and metacherts. Radiometric ages of the oldest blocks record the crystallization age of the Coast Range ophiolite. The thin (<1 foot) actinolite facies surface rinds on the blocks were formed by metasomatic reactions with the surrounding serpentine-talc schist matrix. The rinds also retain retrograde metamorphic mineral assemblages formed as the temperature declined. During subduction, the older blocks, having traveled a shorter distance from the spreading ridge, retained a shallower thermal gradient than the older ones. The most difficult question to answer is how these deep-seated rocks were brought to the surface. Exhumation probably occurred along normal faults oriented roughly perpendicular to the down-going subduction zone. The eclogites came from the greatest depth, and the metagraywackes from shallower (25 km.) depths. The rounding of the blocks occurred early in the subduction process. In the early stages of the subduction zone development, relatively young, “hot” oceanic crust is juxtaposed against high temperature ultramafic rocks in the hanging wall. Later, cooler oceanic crust is subducted, creating a steeper (greater temperature difference) thermal gradient across the subduction zone hanging wall-footwall fault contact. Conceptual models like these help researchers like John and David visualize the features they see in the field on a broader tectonic scale. John and David pointed out type location exposures of the milky white, tabular metamorphic mineral lawsonite, first characterized here and named after U.C. Berkeley geology professor Andrew Lawson. Also exposed on the rock surfaces are the green jadeitic pyroxene omphacite and the sodic plagioclase feldspar albite. These minerals are key metamorphic grade indicators used to establish the pressure-temperature conditions under which these rocks equilibrated. The high grade blocks in this area rest on intensely sheared serpentine-talc schist, less common chlorite schist, and late stage silica carbonate mineralized zones. Although the sheared serpentine-talc schist is sporadically exposed at the base of the ophiolitic terrane, it is still a functional marker horizon that is mappable throughout the peninsula. The trail to the fifth stop led over an extensive exposure of massive harzburgite-peridotite ultramafic rocks representing the overthrusted ophiolite sheet. The trail reveals brecciated and microbrecciated cherts of the footwall Franciscan terrane in fault contact with the overlying ultramafics of the opohiolitic terrane. Either highly deformed cherts or sandstone units are the only Franciscan lithologies observed in direct contact with the overlying ophiolite. These units have been contorted, folded, bleached, brecciated, and metasomatically altered (re-silicified). They are used as markers to help identify the contact between the upper and lower thrust plates. The trek to the sixth stop followed a south-trending drainage in a northwesterly direction along exposures of sheared serpentine-talc schist containing many high grade metamorphic blocks. Along the way the group passed clumps of spring-fed pampas grass marking the base of the thrust fault. The sixth stop is in a saddle between the two ultramafic bodies on Ring Mountain. From the saddle, one can see several ultramafic bodies. The largest, Turtle Rock, can be seen to the southeast. It is a lenticular, rounded shape with its long axis oriented northwest. 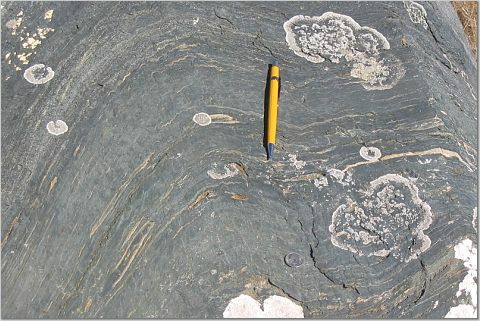 Large slabs of the outer metamorphic rind have exfoliated off the slab on its western side, and its southeastern side has broken away to expose a tightly folded interior composed of glaucophane-lawsonite-jadeite-garnet blueschist. The latter records up to seven deformation events. The surface rind is an actinolite amphibole-rich reaction zone surrounded by weathered sheared serpentine-talc schist matrix. K-Ar age mica dates of the high grade blocks from Ring Mountain are 150 million years, somewhat younger than the oldest high grade metamorphic ages (159 to 163 m.y.) considered to represent the onset of Franciscan subduction. From Turtle Rock the group followed the hiking trail upward to the southeast into the ultramafic rocks capping Ring Mountain and down slope back to the church parking lot. 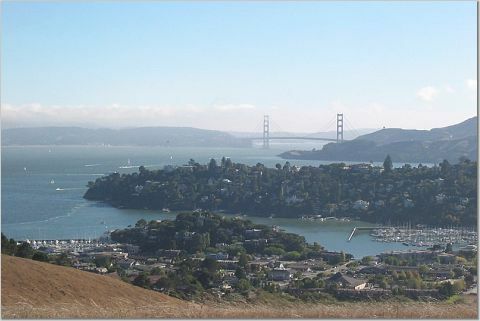 The view from this vantage point was a spectacular panorama of the southern Tiburon Peninsula, Belvedere Island, and the Marin Headlands-San Francisco peninsula joined by the Golden Gate Bridge. After lunch the trip assembled on the southern Tiburon peninsula on the east limb of a large syncline that has been tightly folded into a syncline-anticline pair. Here the stratigraphy and structure are similar to Ring Mountain; an ophiolite sheet thrust over a Franciscan sedimetary-volcanic terrane along a low angle fault. The group marched uphill and crossed the east synclinal limb, traversing part of the upper ophiolite terrane into the footwall sedimentary sequence. 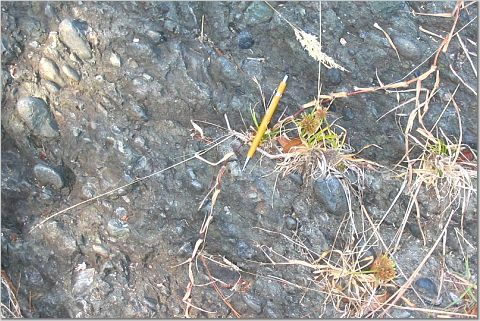 The fault plane is marked by platy serpentine slabs protruding out of the ground, a feature common in this part of the peninsula. 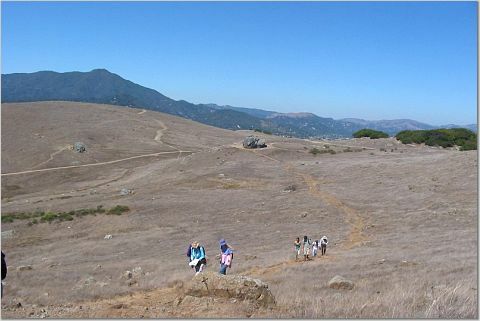 The trail led uphill into an altered chert that is the uppermost footwall unit cropping out on the southern peninsula. 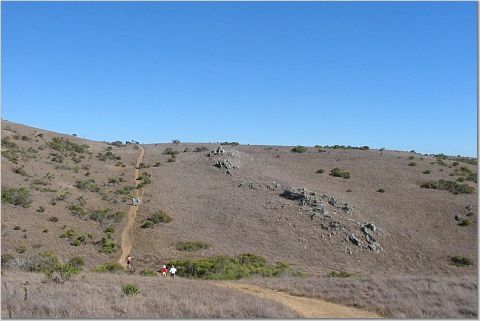 Continuing uphill, and down section, the trail crosses a narrow graywacke unit followed by a pebble conglomerate exposed along the ridgeline. These three units are laterally continuous along the ridgeline southeastward to the tip of the peninsula. Slight thickness and facies changes occur along strike, but the general characteristics continue southward and may also be present in nearby Angel Island. As the trail turns southwestward, the section repeats itself in reverse order (up section) and crosses over the low angle thrust plane into the hanging wall ophiolitic rocks. The platy “tombstone” serpentine slab structures along the thrust plane are more pronounced here and are thought to have formed during the ophiolite emplacement. John Wakabayashi noted that the Tiburon area is actually on the northeast-dipping limb of a larger synclinal fold extending to Novato. It is comprised of several imbricated thrust sheets extending across the Bay into San Francisco. He pointed out that the simplified conventional model of younger oceanic terranes in the subduction zone complex being accreted against older ones is not necessarily observed in this region. 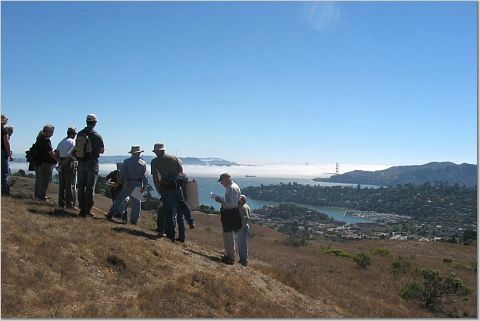 The older Marin Headlands, for instance, was emplaced after the younger Tiburon group. This obviously complicates the tectonic history of the Bay Area — and challenges the creativity of Franciscan structural geologists! David Bero is currently mapping on Mt. 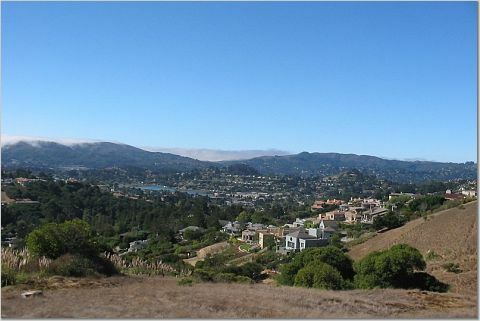 Tamalpais, which follows the structural trend of the Tiburon Peninsula. He hopes to determine if the same structural features he sees in Tiburon continue to the northwest. He also proudly acknowledges some support from Dr. Rolfe Erickson of Sonoma State University for access to thin sectioning equipment, and to Christine Rowe of U.C. Santa Cruz, who helped digitize field maps, performed X-ray diffraction analysis of field samples, and provided technical input on Franciscan geology. The NCGS is deeply appreciative to David Bero for arranging and leading this impressive field trip to the Tiburon peninsula. David also preceded the trip with a presentation of his fieldwork at the June 30th NCGS meeting, which laid the groundwork for this activity. We all wish him well in his continuing research on the structure and stratigraphy of the Franciscan Formation.